Jim Heimbach sent me, April 12, 2014, about 170 photos on the creation of the belfry. There are plans and a systematic coverage of the contruction from Dec. 1, 2009 to May 30, 2010 with his photos. Thanks, Jim for all of your efforts! Pictures are at the end of this article. It’s a good time to look since April, 2010 it was substantially complete. We’re at Easter time which causes us to look back on many events. 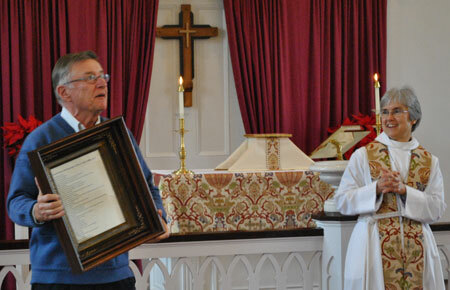 The belfry was re-dedicated on Belfry Celebration Day, Oct. 7, 11:00am. 1. Click the arrow in the top right of the gallery to begin the show. ("Start autoplay"). Slides appear about every 3 seconds. You can halt it by clicking ||. 2. Click the full size gallery link to see it full size.